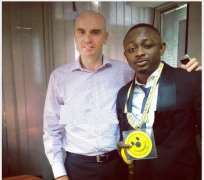 Telecomms giant MTN Nigeria has added Sean Tizzle to their roster of celebrity brand ambassadors for a cool N20 Million . An insider at Tizzle's camp said the deal has been signed and sealed. They like Sean because he's hot and believe they can make money with his music. They also go on to say Tizzle's management has been in talks with MTN for a while and his impressive run in the last 12 months with his mega hit Sho Lee informed their decison to bring him on board.